Henceforth, the establishment decrees, that this day of July the 28th, in the year of our Lord two thousand and fourteen, shall forever be known as "Tombstone Tuesday"
The most recent gig is a tombstone for an upcoming film. 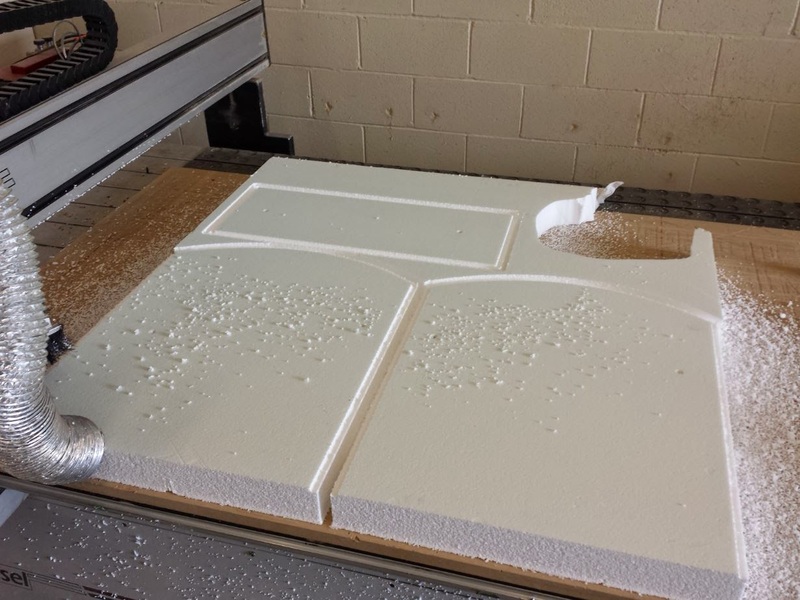 Styrofoam is the obvious choice for this project. I started with the vectors supplied by the Art Department. It was great that they sent everything to size! Our Techno ate through the job pretty quickly. I used our little hot wire cutter to carve a couple of trenches on each side of the tombstone so I could glue in a piece of pvc pipe The pipe is there to accept the 2 rods that they'll pound into the ground on location. No worries if it's windy! I used low expansion window and door foam as the glue. With a bit of water, it should be kicked in about 40 minutes. After the glue had kicked, Jody got started mixing and applying our scenic mud. We tinted it grey to help out with the final limestone color we'll be applying tomorrow. The base for the stone also got it's texture coat as well. We used the crinkled tin foil as a mold of sorts for the edge texture. Once the mud had hardened up a bit, I rolled it with a heavy textured roller. Once that set up further, I was able to use the trowel to burnish the texture down a bit. Tomorrow I'll get the text cut, and the final paint done! We work quite a bit with one particular client who does a ton of events. These are the guys that we do almost all the beer projects for. The Thursday night go ahead was a small build for the upcoming Boots and Hearts music festival. The clients have the ability to do a lot of stuff in-house, but they do sub out to us on lots of things as well. 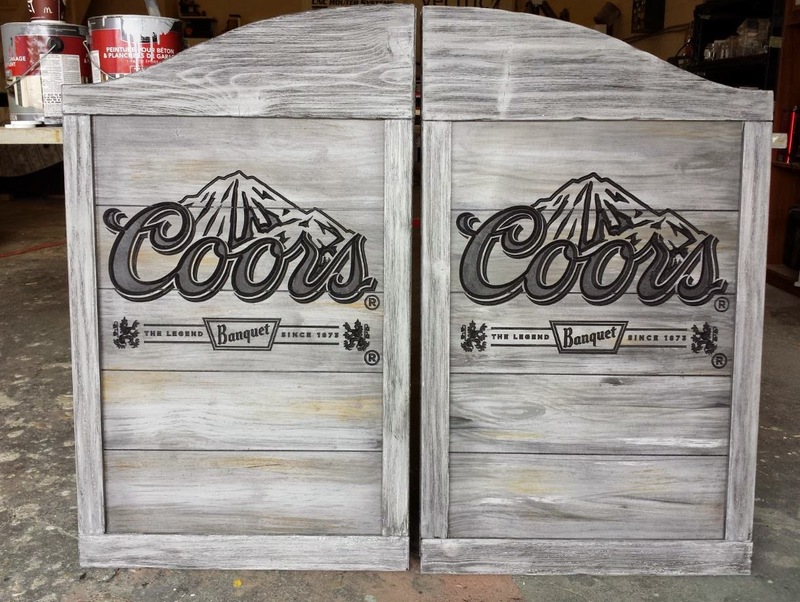 They needed 3 sets of old west saloon doors for the Coors beer tent. 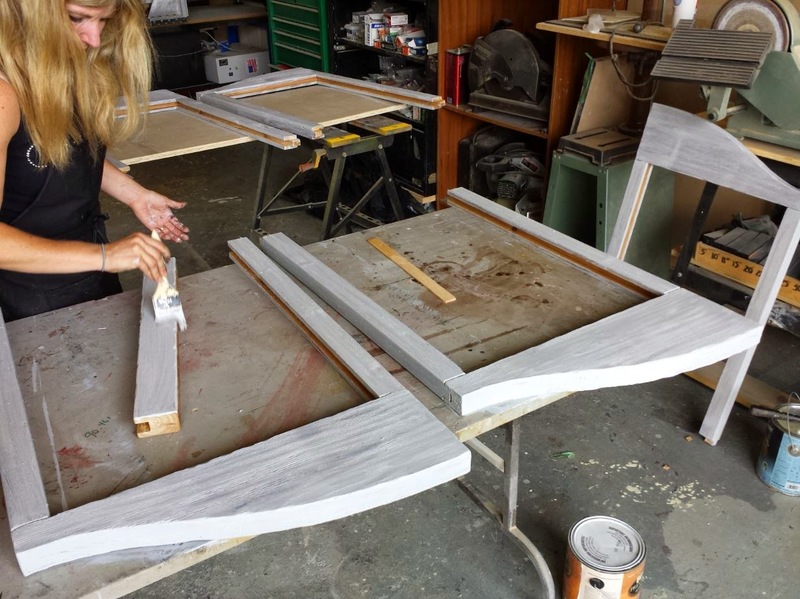 The first step was the center panels of the doors. These were cut on the saw from 2 sheets of 3/4" birch ply. I wanted to do individual slats, but for a number of reasons we went with ply. 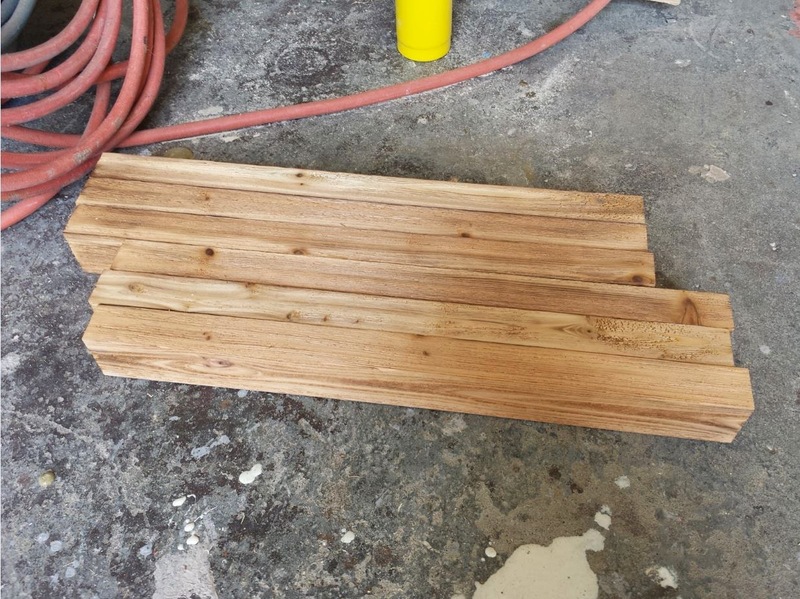 I also grooved the sheets with the saw to represent the slats. 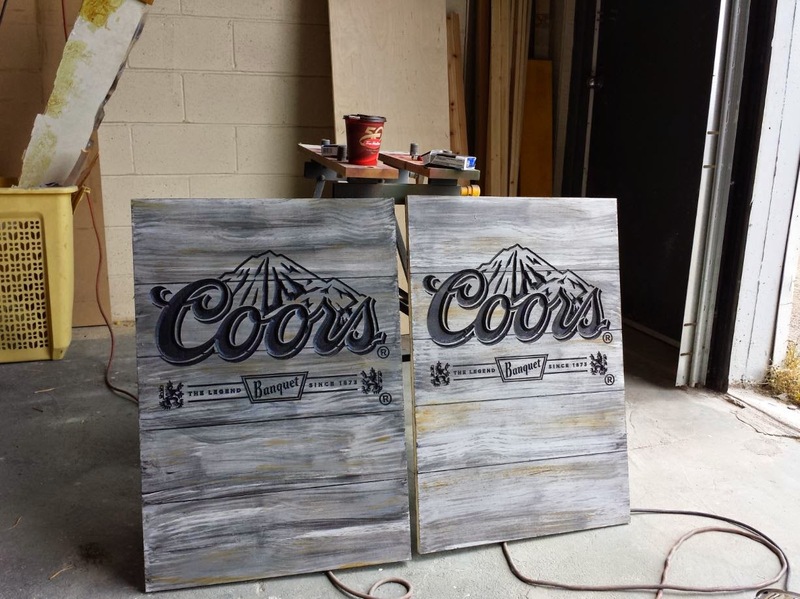 Jody got to work painting these while I milled up the rest of the wood. 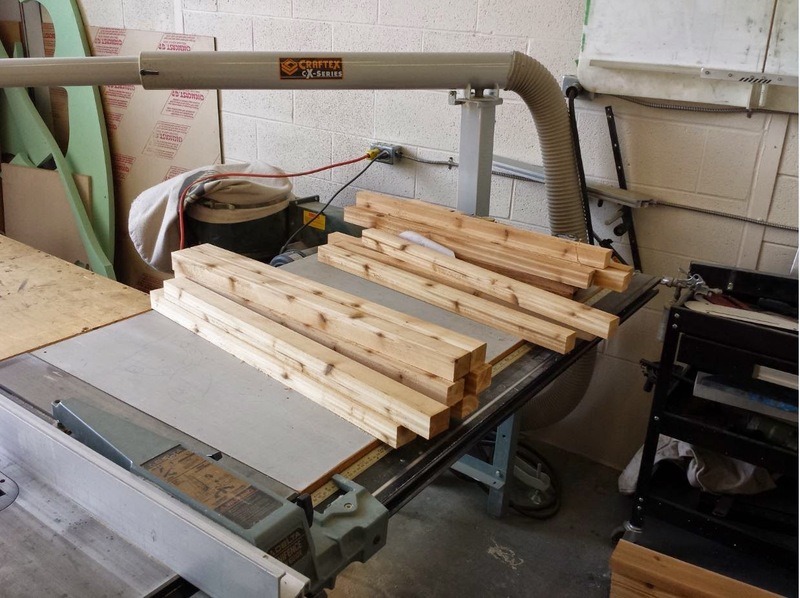 The rails and stiles for the doors were also cut on the table saw from 2X4 and 2X6 cedar. I went with cedar specifically because it ages really nice with a wire wheel, and does it quickly! Once all the wood was cut and rabbeted on the table saw, I set to work with the wire wheel and a rather large corded drill. All in all, it took about an hour to run through all the pieces. 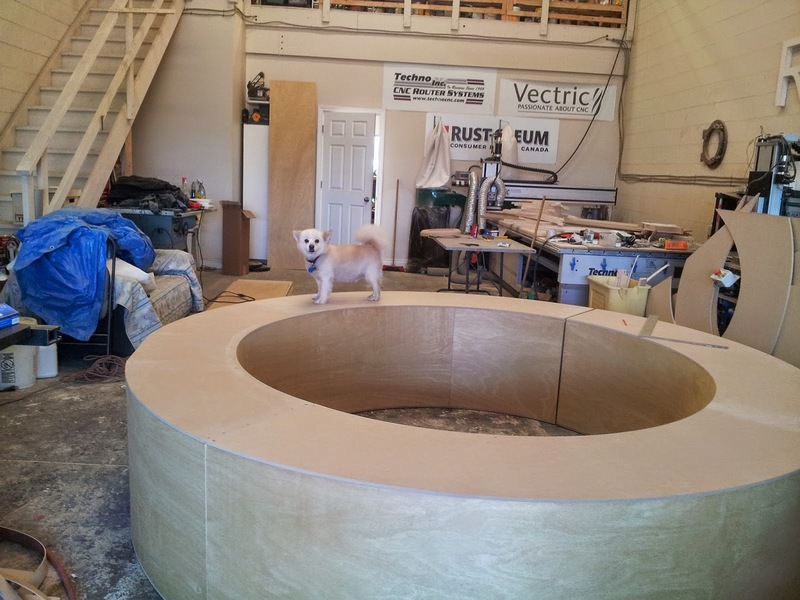 By the time I had finished all the pieces with the wheel, Jody had all the center panels aged nicely! These also got a coat of satin clear. Because we have to v-carve, and paint the logo, we wanted to clear the panels to make painting the text as easy as possible! 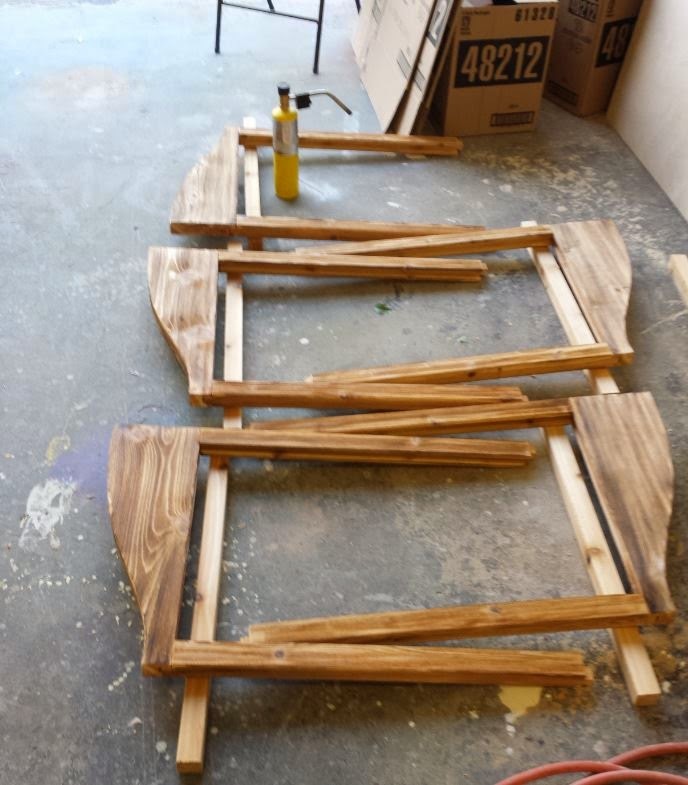 By end of day Friday, I had all six frames fastened up, and set them off to dry. Finally, done work at 4:30! WOO-HOO! Saturday morning had Jody tackling the paint on the frames. It was a shame to have to faux finish the real cedar, but it had to match the paint job on the center panels. Plus, the paint is a nice sliver guard for the 1000's of people that will move through these doors over the course of the 4 day festival. While Jody was killing it in the paint department, I was running the Aspire files for the center panel logo. Each door ran approximately 28 minutes on our Techno. I slowed the machine right down to about 210 IPM to avoid as much chipping/ blowout as possible! After the first door came off our Techno, Jody and I would get the logo filled in with paint, and by the time it was painted, the next one was ready! Because the plywood absorbed the black acrylic paint very unevenly, it actually took 3 coats to level out. Of course, 3 coats also meant very little sanding of the v-carving as well. Paint is waaaay better than sanding any day! First thing this morning, I headed into the shop to add a light vignette around the center panels, and do the final assembly of all 6 doors. They'll be picking these up around noon tomorrow, and it will be the first job for these guys that the driver didn't have to wait at least an hour before paint dried to load up! Maybe things are looking up!! This was another great project, and a great turn-around time! It was super fun, and stress free! After the waterslide job, Jody and I took about 5 days off to tackle some projects at home, mainly our deck! Then, every project that rolled through the shop, we were unable to post anything on. 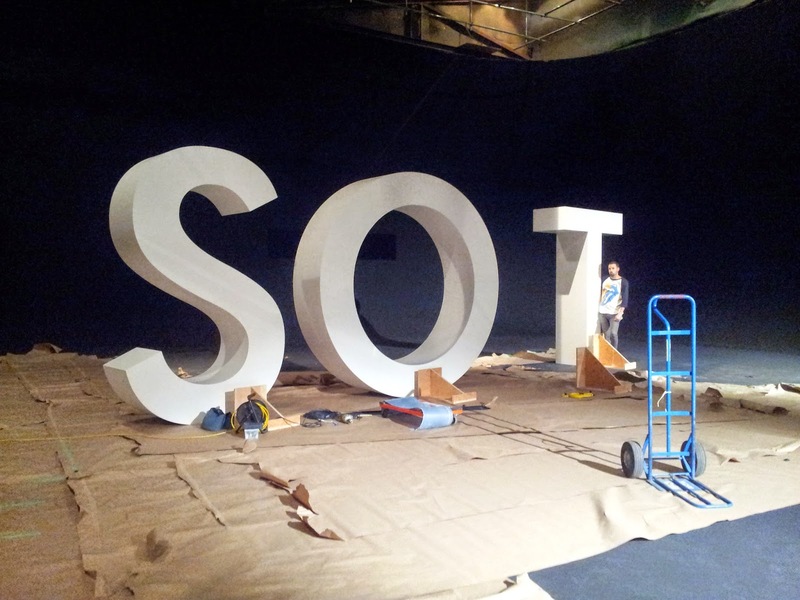 One project we did just finish though, was some giant letters for a commercial shoot. The letters were to spell the word "SOFT" at 9 feet tall. I didn't document it fully, but I did capture some pictures! First up was drawing the file to size. I do all my technical drawings in Corel, and this job was no different! Corel has a ton of great features, that cross both the CAD and illustration borders with ease. The first letter we tackled was the the "O". All the letters faces were cut from 3/8" MDF, while the curved returns were table sawed from 1/8" Marsawa plywood. Being that these will just get coated with Zinser primer as their final coat, the grain of the Marsawa didn't need to be filled. Man this was big! 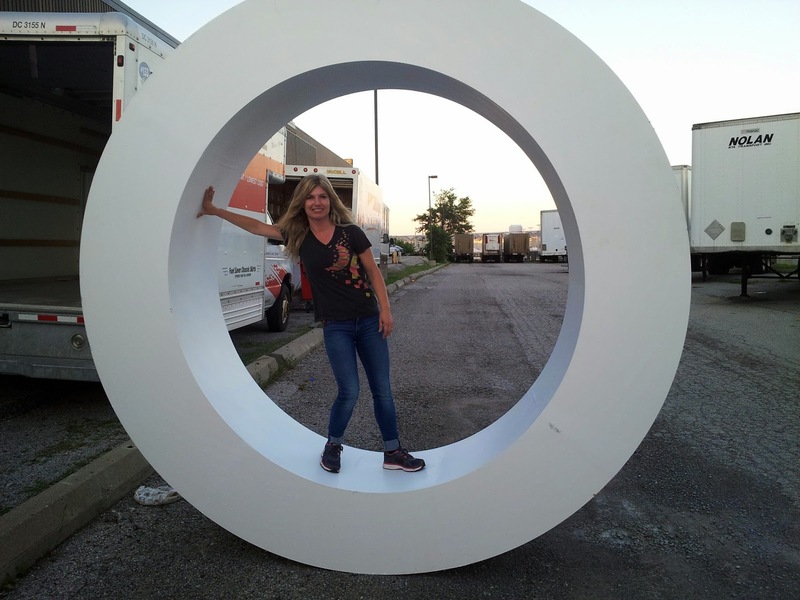 In fact, it was too big for any truck we could rent, so we built it in 2 pieces, for final assembly on set! The S was a monster as well! Wrapping the inside of the letters with the 1/8" was a borderline Herculean task. Me, Jody, and about 30 clamps to be exact. 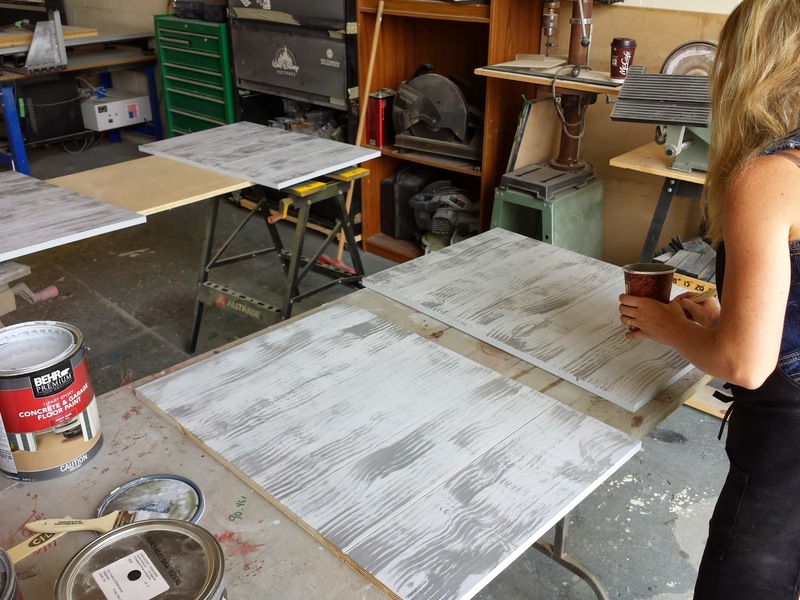 We did break a few sheets in the process though. I tried wetting the sheet at first, but instead of breaking with a snap, it just kind of folded like wet cardboard. But in the end we succeeded! The F and T were saved until last, as they were all straight cuts from the 3/8" MDF. 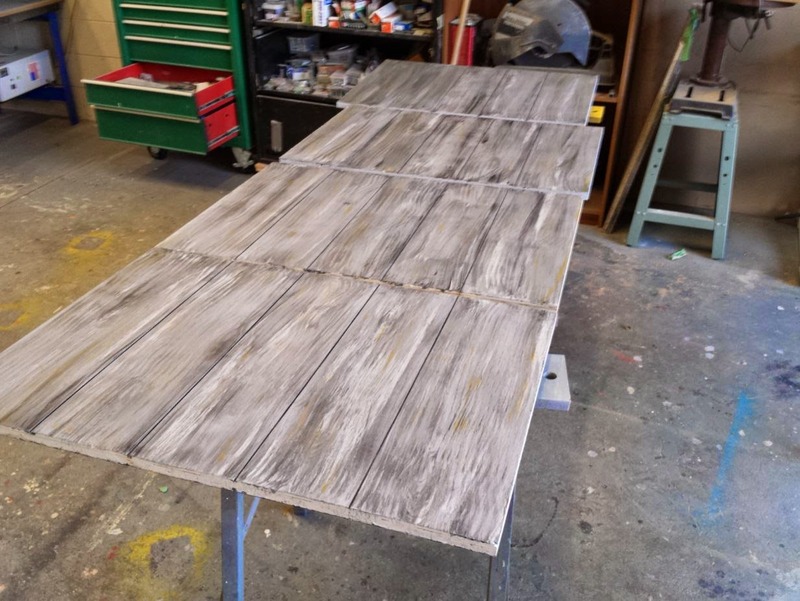 I was going to use 1/4" MDF, but I was worried that it might warp when it comes to painting. The actual shop build took us 3 days for all the letters. Being that the pieces are so big, and heavy, the painting was to be done entirely on set, to prevent any damage to the finish. Plus it also meant we didn't have to be very careful loading the truck. 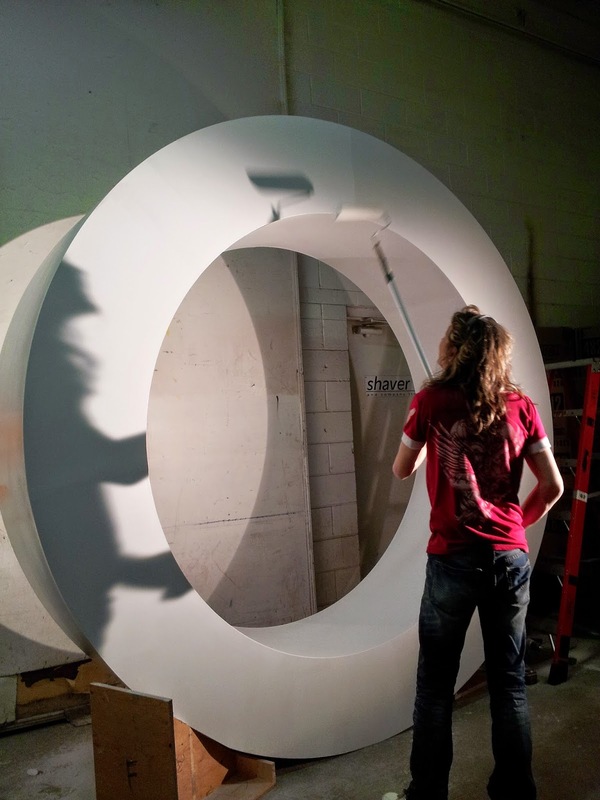 On load in day, we got to the studio around 1:30, and started assembling the O. This was the only letter that needed to be put together. It also meant doing the seam filling as well. We did that with compound 45 for speed, and ease of sanding. Still though, by the time it was all filled, sanded and painted, it was midnight. Good job we're only an hour and a half drive from the studio.............It was a late night by the time we got home. We had a great team of P.A. 's at the studio that made moving and installing the letters really easy! In order to make the letters safe, and not have them roll away, I made base plates from 3/4" plywood. Those are the bare plywood forms in the picture. These got lag bolted to the concrete studio floor, then the design of them allowed for the letters to be tilted up and over them. Once standing, I drove screws through the back side of the letters, and into the base plates. The finals looked great with the actress! The O was my least favourite of all the letters to deal with. It was big, a pain to put together, and fill, and paint! So once it was wrapped, we barrel rolled it into the studio, and cut it up with a sawzall! THAT was the best part of the job. Getting to cut it up was quite satisfactory for me! But not before snapping a picture of Jody in the middle!